To the people who love MATLAB, especially for accomplishing the task of image processing it may happen that editing or enhancing the image is felt more comfortable in MATLAB as compared to photo editing software like Picasa, Paint, or even Photoshop! 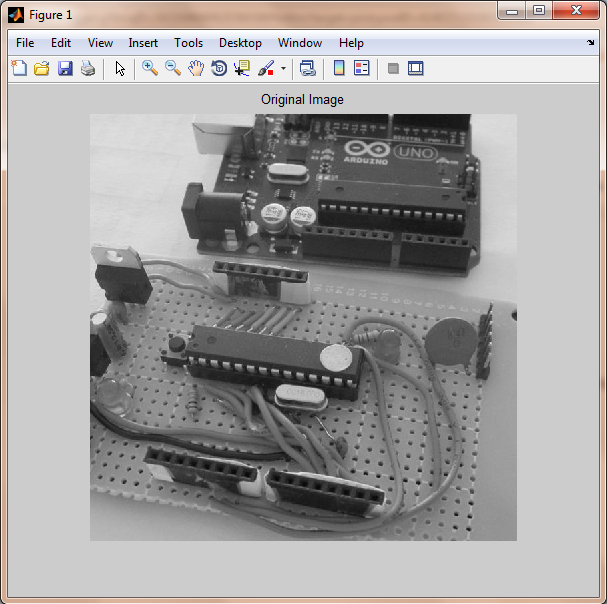 This time we just want to overlay some text using MATLAB over an image. In MATLAB its a 4 line command work (or you may even further reduce it). 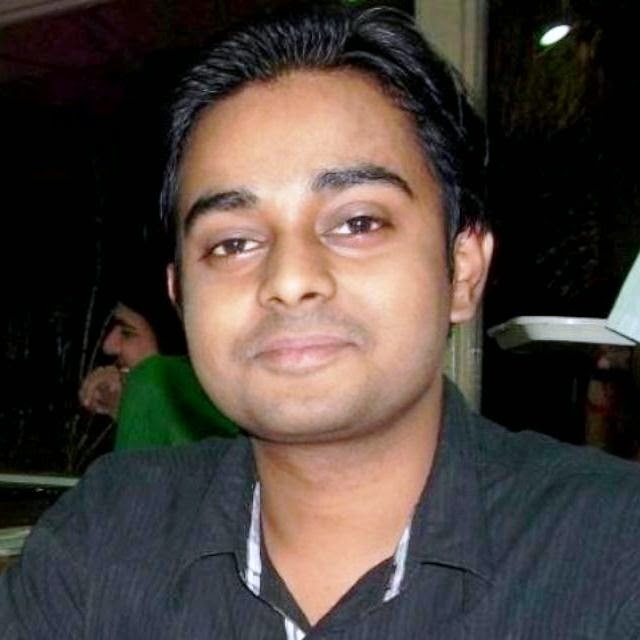 text(20, 300, 'Divilabs.com', 'FontName', 'Comic Sans MS', 'FontSize', 20, . . . Here in the above code we are reading an image & loading it on an image plot window. Then the 'text' function will write the text over the plotted image in that window itself. The first 2 parameters 20 & 300 are just to specify the location of overlayed text on the image. the next 4 parameters 'FontName', 'Comic Sans MS', 'FontSize', 20 are obviously suggesting the font name & size to the text function. What the parameter set 'BackgroundColor', [.6, .6, .6] will do is, they will specify the background color on which the text will be written in the image. 'VerticalAlignment', 'Bottom' will write the text on the bottom of that text box. a = getframe(gcf) : this will click a screen shot of the current image plot window with the text overlayed. So, at last I would suggest that just play around by tweaking the above parameters & get the desired result. If you got some interesting result please do add that in the follow up comments below or just mail be so that I could add up in the article. Contrast stretching is a simple image enhancement technique that improves the contrast in an image by expanding the dynamic range of intensity values it contains. It can only apply a linear scaling function to the image pixel values. It is necessary to specify the upper and lower pixel value limits over which the image is to be normalized. Often these limits will just be the minimum and maximum pixel values that the image type concerned allows. For example for 8-bit graylevel images the lower & upper limits might be 0 and 255. Call the lower and the upper limits a and b respectively. Values below 0 are set to 0 and values about 255 are set to 255. This is what we need while we are developing in communication systems. These zeros could be used just to gather synchronization information or they may act as a start or end delimiter of the transmitted frame. Thus to get the useful data back we need to remove all these padded zeros from the received frame, which could be visualized by a vector in MATLAB. Clearly it has been padded by three zeros at the end & the starting. But How to remove that? And that too specifically by using our Favorite software MATLAB! The above will remove all the leading & trailing zeros from the vector 'x' & store it in vector 'y'. What if we just have padded only the leading zeros & trailing zeros are actually important bits of information, so we just need to remove the leading zeros from the vector 'x'. So, it was a simple stuff. More specifically it was a game of array indexing of/in MATLAB. 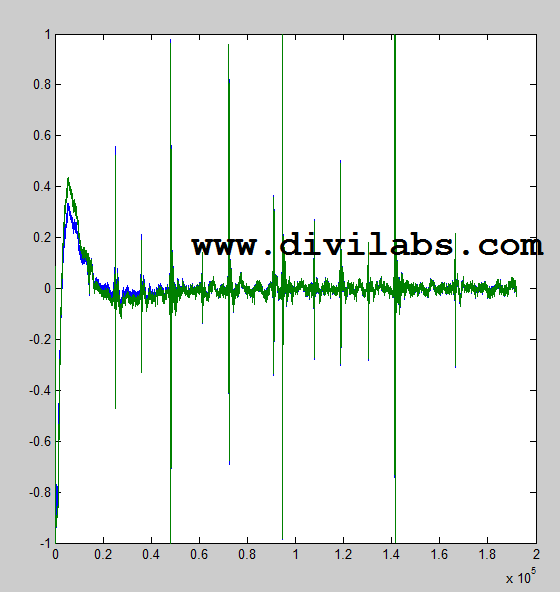 You just going some experience in MATLAB to get an idea of these small but beautiful tricks! What is a text file specifically? A sequence of character. And how these characters can be visualized in terms of a number? By their ASCII equivalent. And the ASCII equivalent code can be converted to binary format to get bit stream. Refer WikiPedia page of ASCII to get a detailed information about ASCII codes. Or search over the internet with the term "ASCII". The following code will be a blend of MATLAB's data file handling (accessing & reading the file saved in disk), some processing & interconversion among data-types (typecasting to be more specific). The resultant 1D array will be a continuous stream of 1s & 0s depending on the text in the text file. 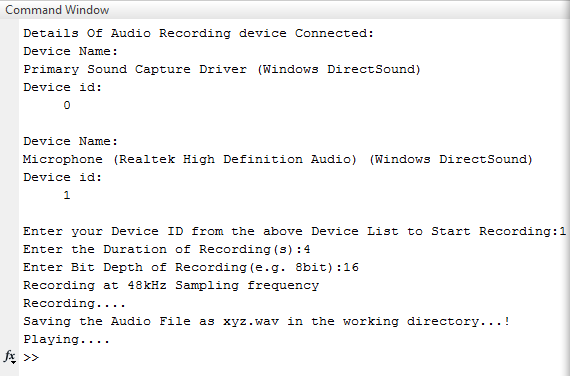 Sample Text & the output bit stream using above MATLAB code to convert a text file to bit stream. Quadrature Phase Shift Keying (QPSK) is one of the type of phase shift keying. 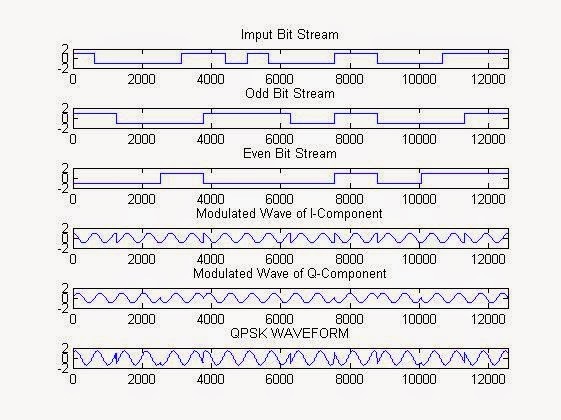 Unlike BPSK which send one bit information at an instance, QPSK is a modulation which sends two bits of digital information a time (without the use of another carrier frequency). They both are by the way DSBCS modulation scheme. 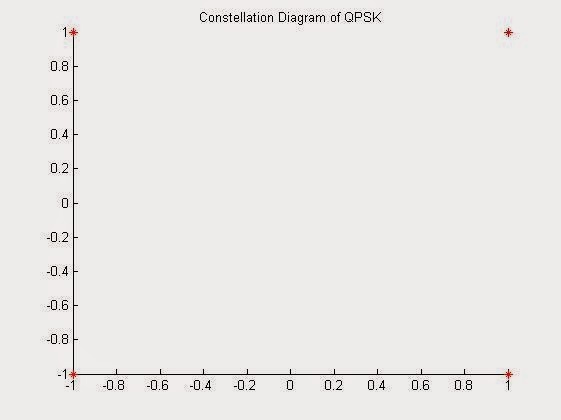 In a sense, QPSK is an expanded version from binary PSK where in a symbol consists of two bits and two orthonormal basis functions are used. A group of two bits is often called a 'dibit'. So, four dibits are possible. Each symbol carries same energy. The above was just in introduction about what QPSK is, search over the internet to get more stuffs about it. You will get number of learning resources which explains you the A-Z of the theoretical aspect of it. 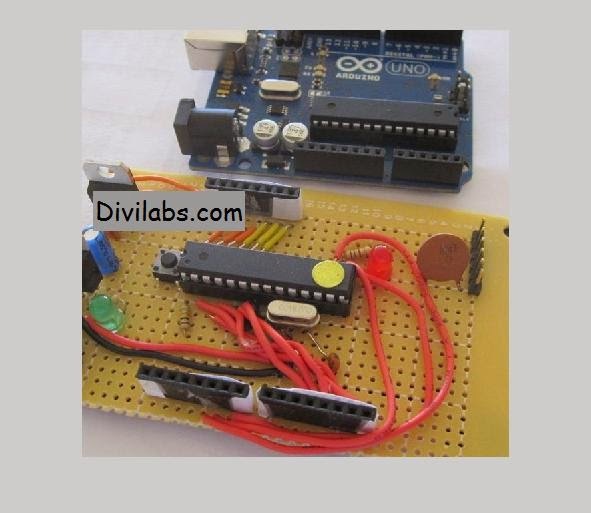 The process which we have followed while implementing on MATLAB is quite conventional. First: get the bit stream. Then Divide the bit stream in 2 bit streams: even & odd. Then apply the BPSK techniques on these 2 bit streams separately. 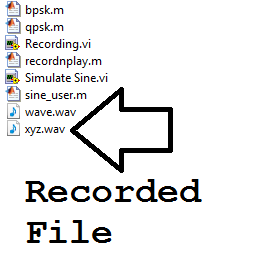 Add the modulated waves to get the QPSK. Another way to implement it in MATLAB or any other simulation software would be, to introduce a phase shift of 90 degree, on each pair of bit change. For more information just search Maxim Integrated QPSK tutorial, here you will get all the relevant equation information.